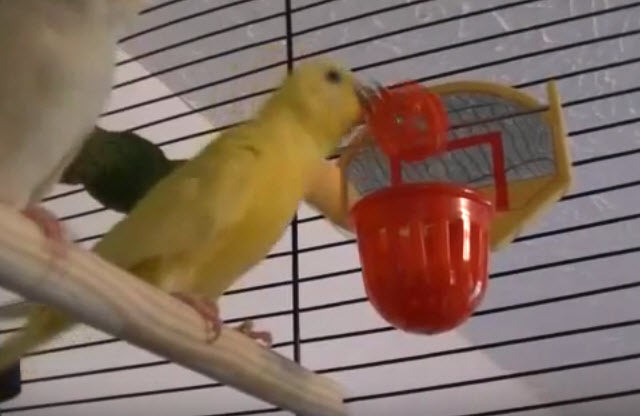 Teach your bird to use its basketball toy! Get a bird basketball toy. Put the toy in your bird’s cage, then give them a treat as soon as they interact with the toy. Continue rewarding your bird each time it touches the toy. Ensure your bird is watching, then lift the basketball by the chain and drop it. Wait for your bird to do the same, repeating the action yourself again if needed, then reward it for lifting the basketball itself. Grab the chain and put the basketball in the basket, wait for your bird to do the same, then reward it for making a basket. Repeat the process, this time grabbing the basketball itself to put it in the basket.